Charming Countryhouse with huge garden - stunning view - with Heating! With heating and beautiful chimney! Ideal for the winter and spring season. As the houses is wonderfully situated in the „middle“ of le Marche you can decide every day anew, whether to go to the beach or the mountains. Step right out of the house and stock up on some culture in the medieval towns and cities everywhere around you. Just around the corner you'll find the historical town of Fermo with cathedral, roman cisterns, museums, theatre, a big market place and many boutiques. You need only 20-30 minutes to the beach and 30-40 minutes to the mountains. Enjoy shopping and beach-life in the beautiful town of Porto San Giorgo or hiking, climbing and mountain-biking in the magical Sibillian Mountains. From the ample terraces you can enjoy the panoramic view over the typical hillside to the often snow covered mountains. The guest house is spacious and well equipped for year round living - cool in summer & warm in winter. Other activities: Many cultural activities including opera and traditional festivals. The living area is comfortable, relaxed and cosy in the winter months with its homely stove and floor heating. All rooms are equiped with energy effective floor heating.u - -- INTERNET ACCESS in a stationery shop and free wireless access in two cafés in Petritoli ---- Enjoy a free bottle of our typical Rosso Piceno on arrival! On request we can provide you with food & drinks on the day of your arrival. Please contact us for further information on location and activities. Einmalig schöne Landschaft, mildes Klima, exzellentes Essen, gute Unterkunft und nette Gastgeber. Gerne wieder. Wir waren dieses Jahr zum ersten Mal bereits über Weihnachten in der Capanna. Das milde Klima erlaubte uns wie erhofft ein effektives Rennradtraining. Der Vermieter ist ja selber ein begeisterter Rennradfahrer. Er hat uns auf den Ausfahrten begleitet und konnte uns auch immer wieder wertvolle Trainingstipps geben. Die Landschaft ist eh einmalig und die Capanna diente uns als gemütliches Zuhause zur Entspannung. Wir kommen auf jeden Fall gerne wieder. we stayed in this wonderful coutryhouse for the second time. As it was once again so hot in July, we especially enjoyed the huge garden with shadow places and its own vineyard. The silence there reduces all the stress one has! it's always a pleasure to have you here. We are looking forward to your next visit. Wir waren anlässlich der Hochzeit meiner Schwester in Petritoli. Sehr nette Gastgeber. Das Haus ist gepflegt und durch liebevolle Details nett ausgestattet. Es liegt mitten in der schönen (ruhigen) Natur. De merveilleuses vacances dans une trés belle ferme, un cadre idyllique, au milieu des oliviers, calme. Au pied d'un village médiéval magnifique proche de toutes les merveilles de la région des marches et proche de la mer. Un acceuil très chaleureux, Margitta et son mari sont des hôtes charmants et leurs petites attentions sont d'agréables surprises. Séjour que nous recommandons à tous nos amis. Nous repartirons surement l'an prochain dans cette ferme. Merci également au personnel du syndicat d'initiative de Pétritoli pour leurs gentillesse leur acceuil. Le Marche - the land of rolling hills is situated between the Sea, medieval towns and the legendary Sibillini-Mountains of the Apennines. Enjoy culture and local cuisine, hiking and mountain biking or simply relax in an area unspoilt by the ravages of mass tourism. Exactly here, not far from Ancona and Fermo, you will find both of our holiday houses- the country house is standing on a hill at the foot of medieval Petritoli and the townhouse in the historical centre of the medieval village Belmonte Piceno. The mountains can be seen from the Terraces and can be reached within 45 minutes. To the ocean you need 25 minutes. Hardly anywhere you go from the mountains to the sea so quickly as here in the Marche – along olive groves, vineyards and romantic ancient villages. 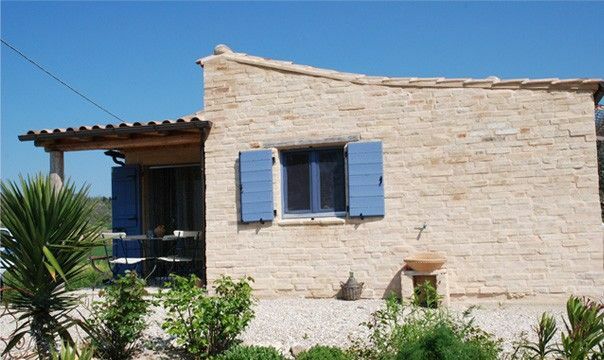 The holiday home is well equipped in the original style of Le Marche and only a 1 drive away from the next airports in Ancona or Pescara (Ryanair).